BACKGROUND: Splenic rupture following colonoscopy is a disastrous complication that carries a high mortality and must be suspected and addressed immediately. METHOD: This is a case report with review of literature. RESULTS: A 76 year-old Caucasian male post EGD and colonoscopy for evaluation of a liver mass was found in shock with severe abdominal pain and distension a day after the procedures. After initial stabilization in the ICU, a CT scan of the abdomen and pelvis revealed splenic rupture with a significant amount of free fluid. The patient was made comfort care, and deceased at 35 hours post-procedure. 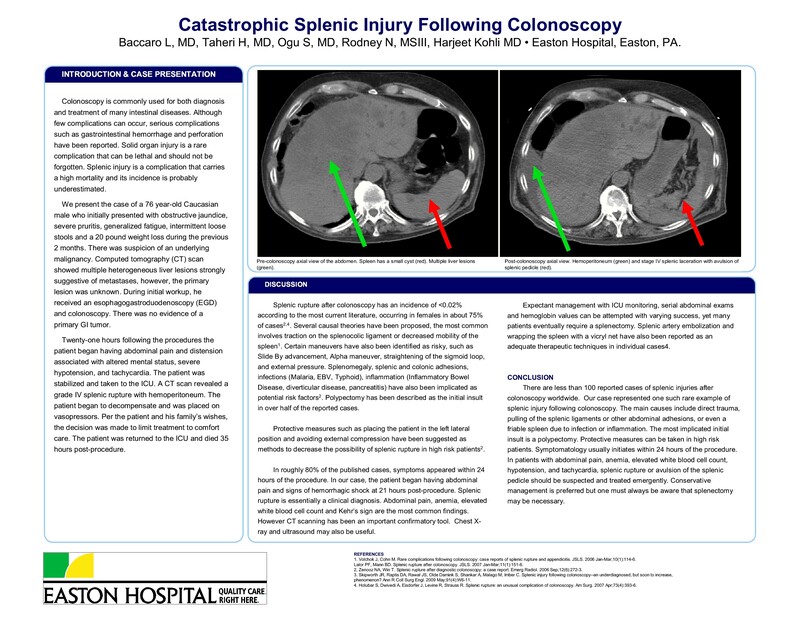 CONCLUSION: Splenic injury following colonoscopy is a detrimental complication which needs to be considered in all unstable patients. Physicians performing this procedure should always remember this problem when confronted with a similar scenario following colonoscopy.